The structure indicated is the popliteus muscle of the leg. The proximal attachment of the popliteus is on the lateral femoral epicondyle, and the distal attachment is on the posterior surface of the proximal tibia. 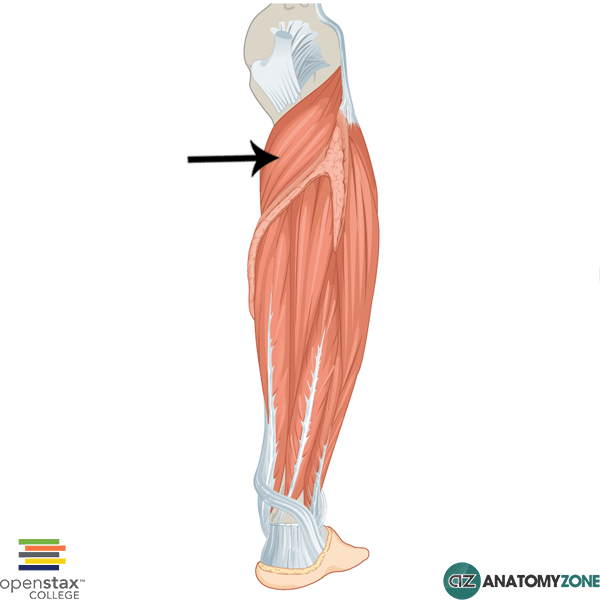 However the popliteus muscles has an unusual structure, in that its proximal attachment is tendinous and the muscle belly lies distally. The main action of the popliteus therefore acts in the direction from distal to proximal and it serves to laterally rotate the femur on a fixed tibia to unlock the knee joint. In addition, if the femur is fixed in the sitting down position, the contraction of the popliteus can cause medial rotation of the tibia.